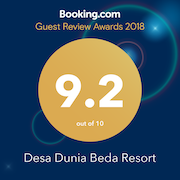 Desa Dunia Beda Beach Resort has many facilities. Whether you’re with us on business, for pleasure, attending or organising an event, you have access to a range of superb comforts and amenities for an effortless, enjoyable stay. From our restaurant and bar, you can enjoy a fantastic view of the beach & the sunset time in a natural surrounding, while enjoying delicious international and local cuisine or a seafood BBQ. All prepared to order by our Indonesian chef and his team. Our pool is located at the center of the resort and only a few meter away from the beach. Swim or sunbathe and enjoy all sorts of activities at the pool. Escape to the islands and get ready to discover the true meaning of paradise. We have wide choice of beach and deep sea activities.